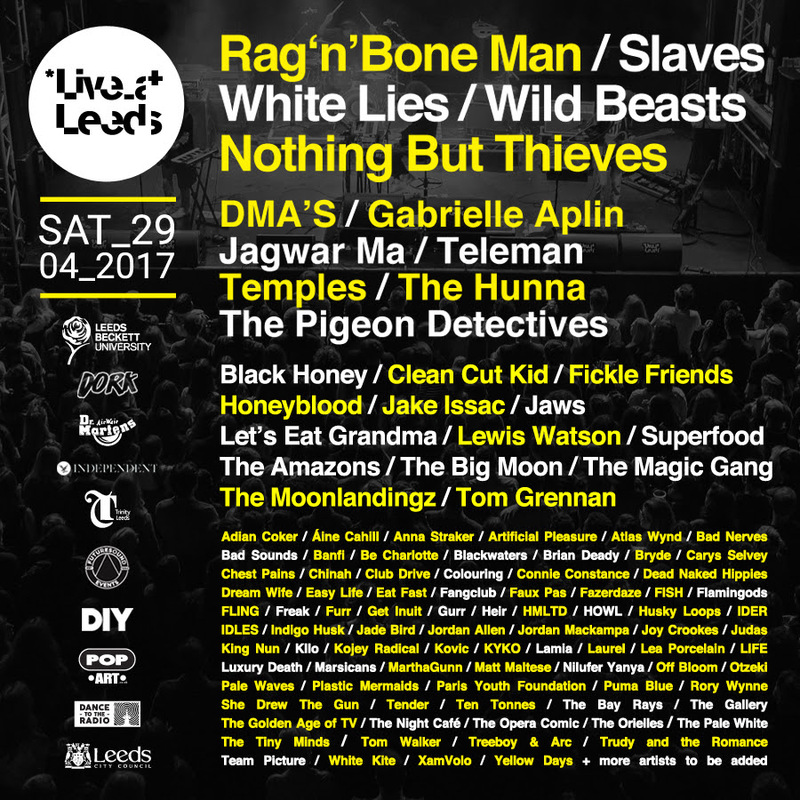 Last year, Live at Leeds celebrated its 10th anniversary with its usual, diverse curation of new and established artists from across the country and the proverbial pond. It was a huge milestone for the Metropolitan festival, which is now considered one of the biggest and best in the country and also an indication that festival season has arrived once again. One of the issues that our previous report noted, was how the layout and close timing of events taking place over Live at Leeds’ 12- hour day made it hard to get a truly varied experience of the event. Unlike the city’s other major indie all-dayer, Gold Sounds, which shacks up in Brudenell Social Club for the duration with around 15 acts, LAL boasts a lineup of 200+ artists of various genres and styles, spread across a vast chunk of venues. However last year was undoubtedly still a success and now into its 11th year, the festival has shown no signs of giving in to logistical pressures, sporting a lineup just as ambitious as before. 2017’s main headliners included the likes of SLAVES, Rag N Bone Man, The Moonlandingz and Wild Beasts amongst a whole sea of emerging and exciting new talent. The programming of this year’s festival saw some notable changes from 2016. One of these was a snazzy new smartphone app, which suffered from several glitches on the day due to an unprecedented cyber-attack. This meant that most of the customisable schedule was inaccessible and a good old fashioned print out of the line-up (or the slick itinerary provided at the wristband exchange) came in very handy. Another, more promising addition to the weekend schedule saw some great acts playing either side of the Saturday, including synth-pop trio Future Islands and North-East indie rock stalwarts Maximo Park. This set-up aimed to provide a kind of opening and closing ceremony, but both gigs weren’t included in Saturday’s cost, meaning forking out extra for separate tickets and may have been a little steep for some. Returning annual events included The Unconference (taking place on the Friday), where those aspiring to a career in the music industry were invited to presentations and workshops presented by artists and journalists. Whilst on the Monday Live at Leeds Extra Time, teams of artists and punters were once again pitted against each other in a football tournament. This years’ POA was to see as much as possible in as many different venues as possible (within reason), missing out the 02 Academy which is often filled with nostalgic mid-noughties indie bands. Leeds-based Team Picture were one of the first acts on our schedule, but travel issues ensured they’d be out of the question. Instead, we headed for Leeds Beckett Students Union’s smaller stage early to catch much-hyped Hull four-piece LIFE. Having built a reputation as one of the best new unsigned live acts in the country and spun consistently by Steve Lamacq, the band’s musical CV was convincing enough. “We’re from Hull, city of culture! And when I go out in Hull, I like to shop for really rare boots” shouted frontman Mez Green, before the band blasted into the snarling punk of ‘Rare Boots’. It’s true that LIFE’s stomping ground is having its day in the sun, after accusations of being a bit boring, but the band do have a lethal cocktail of songs to put any preconceptions to bed. Green introduced tracks with simple statements (“This one’s about Donald Trump”) and narrated tales of drugged up nights out (“Totally off my face, I listen to popular music”), whilst also addressing the snap election with the rallying call of ‘It’s In Your Hands’. Much like their ‘good friends’ SLAVES, LIFE embody the stripped-back, early urgency of UK punk with a great sense of humour and wild stage antics. Brudenell Social Club is one of Leeds most loved venues, so it made sense to make the trek for at least one band on the bill. On the way to catch Lea Porcelain, we decided to stop at The Faversham (a hip bar and kitchen venue near Leeds Uni) to break up the journey. Acts were due to play on the Patio outside, but overcast and unpredictable skies meant that the gig was relocated to an indoor space. Newcastle singer-songwriter Jake Houlsby (described by 6 Music’s Lauren Laverne as “sublime”) was midway through a mesmeric guitar solo on entering the venue, one which lasted for a good few minutes and silenced onlookers. The acoustics of the room provided extra ambience and was probably a lot better suited than the original outdoor setting. Alongside keyboardist Laurie Cook, Houlsby dispatched wonderfully ethereal folk ballads like ‘Vondlepark’ and ‘Carousel’ to a reasonably busy room, considering the outward location of the venue. Riding on the success of their track ‘Warsaw Street’ and impending album Hymns To The Night due in June, Berlin-based electronic duo Lea Porcelain seemed like a good bet. Brudenell’s smaller Games Room felt gloomy upon entering. This only added to the effect that the band were trying to achieve though. “I want to have a darker room, someone turn the lights off. I can see too much” said Julien Bracht (keys, electronics) in a thick German accent. The room dropped into black, leaving only flickering strobe lights that began to pulse from beneath the kick drum. LP certainly know how to hold a crowd with their lighting theatrics and singer/guitarist Markus Nikolaus was an intriguing frontman, who seemed lost in the haze. Their songs are more like hypnotic flashbacks, pulling you into a black hole of whirring synthesizers, clasping triggers and bass-heavy guitar lines. Joy Division, The Cure and all other obvious gothic post-punk influences were present, but what delighted most was the referencing of more euphoric, experimental band’s like Underworld and defunct London art punks S.C.U.M., where the music feels like a semi-improvised journey into the unknown. Heading back into the city centre via cab is a pain, but three quid wasn’t too bad to save the hike. We decided to venture towards the basement of The Key Club (Dork stage) to find North-East rockers Atlas Wynd. The band’s latest single, ‘Mona Lisa’, is a brilliant blues-rock tune, but didn’t translate all-to-well live. They’re a strong trio of musicians, but their cause wasn’t helped by the venue’s poor sound quality and awkward layout. An artist tipped for future success, New Zealand-born Amelia Murray AKA Fazerdaze, was next on the agenda. The DIY indie pop songstress played a set of dream pop inspired ditties to an attentive (considering how much booze is flowing) crowd at Leeds Beckett SU. Murray’s set was placed nicely in the late afternoon slot when crowds began to thicken in preparation for the headliners and the melodic, hazy guitar sound boded well with the sun’s reappearance from behind the clouds. Getting slightly itchy feet, we decided to dash across the city to The Wardrobe to catch Amber Arcades. Last year the Restaurant-come-Basement gig venue played host to the likes of Ghostpoet, who was one of the highlights. It feels a little like an underground cave, where you are stumbling into a secret gig of some sort. With the critical acclaim of her debut album and her intriguing backstory as a Legal Aide for Syrian Refugees, AA’s Dutch brainchild Annelotte de Graaf drew a decent crowd. Her vocals elevated these indie pop songs, including the brilliant shoegaze-induced title-track ‘Fading Lines’, which soared to a huge climax. A first visit to The Nation of Shopkeepers was slightly tarnished by the impossibility of seeing Superfood. The band were 45 minutes late in a space, squeezed well over capacity to the point where suffocation may have been a viable option. Instead, we diverted towards central venue Headrow House for Haus. Having recently finished a UK tour, the London band are making waves with their self-styled indie rock, channeling the likes of Bloc Party. Even with a delayed start time due to guitar issues, they proved why their hot property with one of the performances of the day, both musically and physically. Tracks like ‘Levels’ provided The Headrow crowd with a much-needed second wind, relinquishing any signs of tiredness after nine hours spent wandering the City. With some headliners already been and gone, we opted to stay central and seek out Wild Beasts at Leeds Beckett SU’s bigger stage. As one of the most consistent indie band’s in the UK, Wild Beasts aren’t afraid of putting on a bombastic show and their latest album has changed their live sets dramatically (for the better). Most of Boy King’s best tracks were given an airing (‘Alpha Female’, ‘Celestial Creatures’), capitalising on Hayden Thorpe’s (Vocals, Bass, Synth) distinctive falsetto, whilst old favourites ‘We still got the taste Dancing On Our Tongues’ and the driving synthesisers of ‘Wanderlust’ had the crowd in hysterical motion. ‘Lion’s Share’ has also become one of the band’s best tracks and packs an emotive punch live, stripped back to bare piano keys. “You don’t know how great it is to be back here” said guitarist Tom Fleming, as the band wrapped up the set and the night with the hearty refrains of ‘All The King’s Men’. Despite some of the timing and capacity issues, LAL manages to distract from its technical hitches with the draw of a fine and varied lineup. There’s no way around the venue distances and although there could be more focus on one area, that would only discourage the variety of great locations on offer. The addition of new Fringe stages is great but also makes it harder to decide on where to go and what to prioritise. Overall LAL is a brilliant festival experience for the price and offers a range of additional events that most others don’t. Its title as one of the biggest and best in the country isn’t under threat just yet.